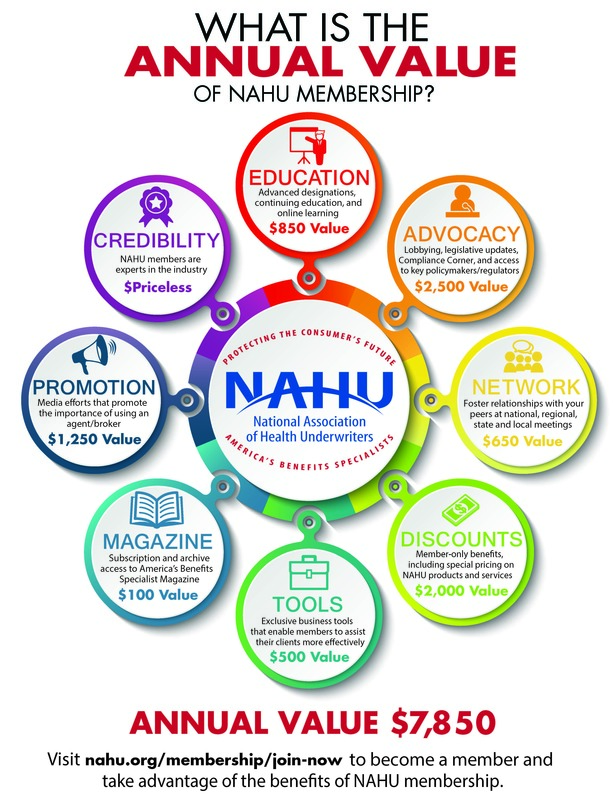 Why Should You Join NAHU? Do you talk to Congress? If you’re not a NAHU member, chances are, you’re not being heard. By joining NAHU, you join 20,000+ health insurance professionals, making you part of the most effective voice in the industry. In addition to being posted on the web site, this weekly legislative update is sent to NAHU’s key contacts in congressional districts across the country, and gives our most active supporters the information they need to be effective representatives of NAHU’s positions on critical issues. Join your peers for this online discussion group where members join together to discuss their problems and offer solutions. It’s a very effective way to garner business both locally and nationally. Don’t underestimate the power of networking. Local, state and national meetings all give you the chance to meet health insurance professionals just like you. You’ll find thousands of people waiting to do business and share information with you. Use the link above to find the chapter nearest you. Twice a year, NAHU invites its members to gather together to share information, views, and ideas. These events include the Annual Convention, usually held in June and the Capitol Conference—your chance to voice your opinions to Washington. Click here for additional new member information.